This window is displayed when you choose the Go to command from the Folder menu. 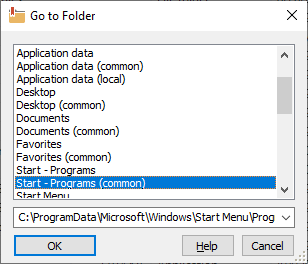 You can use this window to type in a path to the folder you want to navigate to, or to quickly navigate to one of the special folders of Windows. A special folder is a folder used by Windows for special purposes. For example, the Desktop folder is used to store the items displayed on the Desktop, the Start Menu folder is used by Windows to keep the shortcuts that appear on the Start Menu, and so on. Note that the content of the list depends on the version of Windows that you use, as well as on the configuration of the user's accounts that you have set up. If you don't want the list to display all available folders, you can choose to hide some (or all) folders in the list. To hide a folder, right-click on it in the list and choose the Hide command. If later on you change your mind, you can unhide the hidden folders by right-clicking on any folder in the list and choosing the Unhide command from the menu.